A 27-year-old Chicago Lawn man was shot in the shoulder as he drove his pickup truck near 50th and Karlov at about 4:00 a.m. Sunday, September 15. The victim told police that he was driving north on Karlov, watching a drunk friend and another person walk home, when two gangbangers appeared on foot and started flashing gang signs. Moments later, according to the victim, one offender threw a brick at his truck and the other drew a pistol and started firing at him. The victim said the side passenger window shattered, and he felt pain in his right shoulder. He sped away north on Karlov and drove himself to Mt. Sinai Hospital. The offenders are described as white Hispanic men age 18-20, 5'5 to 5'9. The victim said he did not know what gang they were from, since he himself is not a gangbanger and does not recognize signs.Police reported that they noted gunshot damage of the truck's tailgate and found red plastic shards and a landscaping brick on the street at 50th and Karlov. A 50-year-old Garfield Ridge man told police that he was stabbed in the leg during an argument with two men in an alley near 53rd and Nottingham at about 11:00 p.m. Friday, September 13. The offender who stabbed him in the right thigh is described as a white man age 40-43, 5'8 and 160 pounds, short blond hair, wearing a blue t-shirt and blue jeans. There was no description of the other man. Both offenders fled in a burgundy four-door vehicle. The victim made his way to the Subway sandwich shop near 54th and Harlem, where he called police. He was treated and transported by CFD ambulance to MacNeal Hospital. 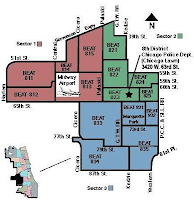 in Beat 813 or 833 (see map), come to West Lawn Park at 7:00 p.m. Tuesday, September 24. Hear updates on crime in your neighborhood and learn how you can work with neighbors and police to make the community safer and better for all. A 16-year-old West Lawn boy told police he was robbed as he walked home from Hubbard High School, near 63rd Place and Springfield at 8:30 a.m. Friday, September 13. He said that two offenders forcibly took his cell phone and a yellow metal chain and ran away north on Springfield. One is described as a black man age 25, 6'2 and wearing a gray sweater. The other is described as a white Hispanic man age 20, 5'5 and wearing a brown sweater and beige pants. A warehouse near 39th and Karlov has been burglarized for the third time in recent weeks, according to its manager. The 43-year-old Chinatown man told police that he discovered the most recent incident on the morning of Monday, September 16. He said that about $25,000 worth of copper tubing has been stolen. The CPD incident report did not indicate if there was any sign of forced entry. 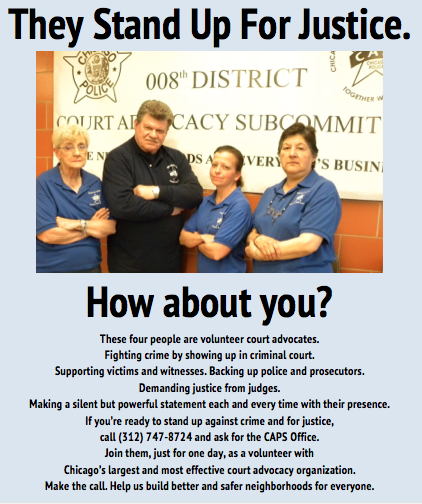 Want to help a crime fighting group and shop at the same time? 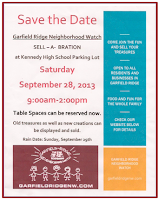 Check out the Garfield Ridge Neighborhood Watch's Sell-A-Bration, set for 9:00 a.m. at 2:00 p.m. Saturday, September 28 in the parking lot of Kennedy High School, 56th and Narragansett. 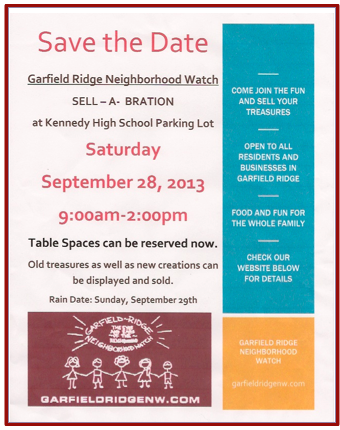 Stop by and shop for the best rummage items from Garfield Ridge's closets, attics, basements and garages--as well as new craft items. A 24-year-old La Grange Park woman renting a residence near 58th and Merrimac told police on Monday, September 16 that someone had stolen her 42-inch flat screen TV from the garage at the address. She said she had discovered the crime at 5:50 p.m. Friday, September 13. There was no sign of forced entry, and the victim claimed that her landlord told her that son stole the TV to fuel his gambling addiction. The landlord reportedly said that she has no ability to compensate. The incident report indicated that the suspect, a 20-year-old man, remains at large. Burglars pushed in a window air conditioner at a first-floor apartment near 63rd and Karlov, entered and stole a .357 magnum hand gun, two TVs, two laptop computers, a printer, a Blu-ray disc player, exercise gear, assorted jewelry, $5,000 cash and various other items. The crime was discovered by the victim, a 27-year-old man, at 8:00 a.m. Wednesday, September 11.
at the same time? 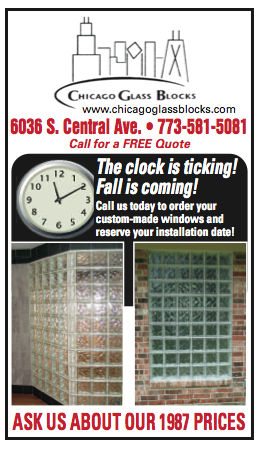 Check out this Southwest Chicago Post article about glass block windows! Burglars entered a house near 53rd and Long and stole a computer, a TV and a bottle of cologne. The crime was discovered by the victim, a 35-year-old man, at 10:00 p.m. Monday, September 9. The CPD incident report did not say how or where entry was made. Burglars forced open a rear window of a home near 50th and Karlov and stole a tablet computer and a digital camera. The crime was discovered by the victim, a 32-year-old man, after he returned from shopping at 3:00 p.m. Monday, September 16. Burglars forced open the back door of a home near 73rd and Ridgeway and stole a TV, assorted tools, a hunting knife and a set of silver spoons. The crime was discovered by the victim, a 43-year-old man, at 5:55 p.m. Monday, September 16. A 48-year-old woman returning from a five-day vacation found an open front door at her home near 61st and Mason. The crime was discovered at 12:30 a.m. Tuesday, September 17. She found that burglars had stolen a TV, a laptop computer and a PlayStation3 with video games. There was no sign of forced entry, and she told police that when she left for vacation, she had put her house key in the mailbox. Burglars entered the rear of a home near 53rd and Kenneth and stole assorted jewelry and $200 cash. The crime occurred at about 1:30 p.m. Wednesday, September 11. The victim, a 76-year-old woman, told police she had left home briefly to run an errand and left the rear door unlocked because her husband was pulling weeds in front of the house. Burglars forced open the service door of a garage near 61st and Komensky and stole a bicycle and the license plates off a 1998 Ford minivan parked inside. The crime was discovered by the victim, a 41-year-old man, at midnight Wednesday, September 4 but not reported until Sunday, September 15.